Swarm robotics is a hot research area. Various algorithms for distributed problem solving are being developed, particularly in simulations. The focus is on complex, emergent behaviour arising from the local interactions of individuals following simple rules. There's nothing like reality to test out your robots, so research groups are beginning to invest in physical robot swarms. 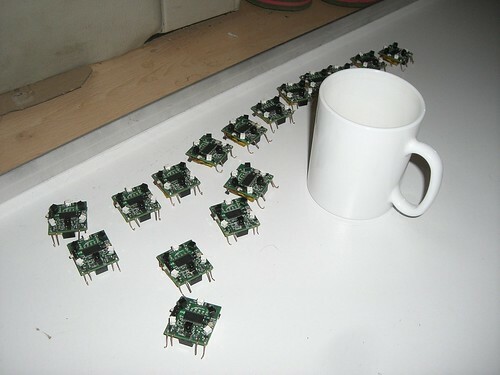 The cost of current robotics platforms prohibits experimentation with swarms numbering more than a few tens of units. As a result, the practicalities of software and hardware maintenance in large swarms are yet to be addressed. The Formica project began as a group project in the fourth-year Biologically Inspired Robotics module of the electronic engineering course at Southampton University. Formica was conceived and developed by Rob Spanton, Steve English, Alexis Johnson, Jo Sun and me, Jeff Gough. The project takes its name from the latin word for ants, as the robots were developed to explore the behaviour of social insects. The robots were demonstrated at ALIFE XI - the 11th international conference on artificial life in August, where it became apparent that an open source software and hardware release would be well received. The abstract submitted to the conference is published here . Twenty-five robots were produced for the project, working out around £24 each. There was a very tight schedule, and a prototype PCB spin was made before the production run. If the project were repeated for the same number of robots and a single PCB order with a two-week lead time, the cost would be reduced to around £15 per robot. Of course, with a larger production run, unit cost would scale favourably. schematic and PCB layout are released on the downloads page, and the firmware is available here. Thanks go to Dr. Klaus-Peter Zauner, Dr. Alun Vaughan and Eric Cooke in the School of Electronics and Computer Science, University of Southampton, for their support of the project.